Born in Beyrouth (Lebanon). Starts with piano when still really young, and around 10 or 12 turns towards more rock instruments, guitar and drums. He arrives in Paris in 1996 and learned to play jazz and then discovers improvisation. In 1999, he decided to devote himself fully to free improvisation. Because he was following philosophy studies at that time, he is strongly attracted by the mean of time in free improvisation, time as an instant and also as an essential factor in social and human behavior. 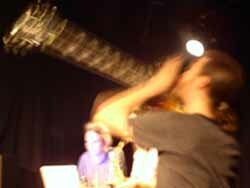 He is a member of Ivraie, improvisation orchestra based at Instants Chavirés, and of Topophonie, an association which organises outside performance in public spaces. He works with Stéphane Rives, Christine Sehnaoui, Mazen Kerbaj, Thierry Madiot, Franz Hautzinger or Le Quan Ninh.